The bronze plaque is been affixed to a brick wall of the Concord Masonic Lodge #58. Three of the screw coverings are missing, leaving only the one in the top left corner, which appears to be a flower or insignia. The inscription compromises nearly two-thirds of the plaque. Beneath the inscription is an insignia, traditional to the Daughters of the American Revolution. The insignia is a rotary, with radii emanating from a central point, surrounded by a wheel which is pierced by a distaff (lower right quadrant to upper left quadrant). "Miles Harvey Chapter to Unveil Bronze Tablet," The Daily Southerner (Tarboro, NC), October 28, 1925, 1. Mrs. C.C. Todd was the regent of the Miles Harvey Chapter of the Daughters of the American Revolution at the time of the unveiling. The unveiling occurred at a district-wide meeting and was announced ahead of time in the local newspaper, The Daily Southerner. Following the unveiling of the plaque, Mrs. W. N. Reynolds presented an elm tree, which was also dedicated. It is believed that George Washington was standing under an elm tree in Cambridge, MA when he took command of the Continental Army. 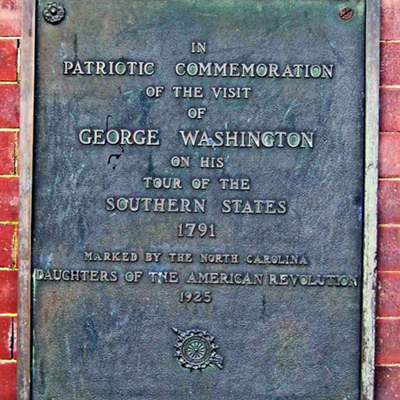 The plaque was dedicated to celebrate George Washington’s visit to Tarboro, NC. This visit occurred during his tour of the Southern United States. He stayed in an inn where the Concord Masonic Lodge #58 is currently located. 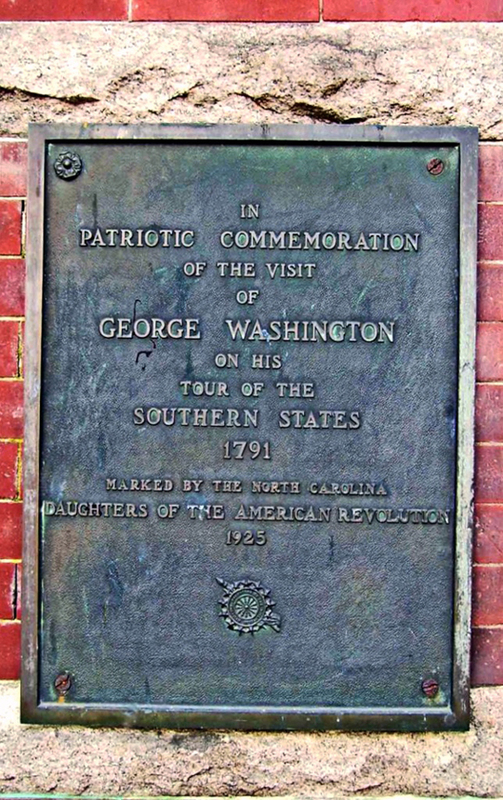 Washington wrote in his diary that "Tarborough [was] a place less than Halifax, but more lively and thriving..."
There are several stone markers across North Carolina that commemorate President Washington's tour of the southern states in 1791. Notable among them are George Washington Tree Marker in Hampstead outside Wilmington, George Washington and Henry Clay Marker in Wilmington, George Washington Boulder in Lexington, "George Washington Visit in Greenville, "George Washington Stopped Here" Marker in Arcadia, and a stone marker at Guilford Courthouse. The plaque faces Main Street on the brick facade of the three story Concord Masonic Lodge building, not to be confused with the contemporary Masonic Lodge located outside the historic district. The temple was built in 1907-1908 on a lot bequeathed to the lodge by Francis L. Bond. The building is situated on the east side of Main Street and the north side of Pitt Street. The local area is a small commercial center with on-street parking. On October 28, the Masonic Lodge voted to send $10 to the Miles Harvey Chapter of the Daughters of the American Revolution to help pay for bronze tablet commemorating the visit of George Washington to Tarboro in 1791.